Do you have a parent, a spouse, a sibling or other family member with macular degeneration? Are you responsible for some or all of the caregiving for your loved one? Perhaps you could use some guidance on not only caring for your family member but also caring for yourself. I had the privilege of meeting Dan Roberts, the author of The First Year: Age-Related Macular Degeneration: An Essential Guide for the Newly Diagnosed and his wife, Chris, at the annual Visions 2012 Conference in Minneapolis. It was quickly apparent that Chris was a great support to Dan. 1. Tell us about yourself, your family, hobbies or interests. I am 65 years old, and over the past 45 years have been most commonly known as Dan’s wife, Joe, Jeff, and Julie’s mom, or Eva, Ayla, Maddie, and Danny’s grandma, depending on where I am. And I am blessed and proud to be each of those. These are the people who make me who I am. I love being busy, mostly helping where help is needed, be it within family or elsewhere. I love helping Dan with his many callings, but he is always supportive of me abandoning him to help someone in need. Therefore, I have enjoyed many years of volunteering with PTA and non-profit children’s and community organizations. One of my most rewarding experiences was when I was able to be with and help a good friend, who had no one else, through her last year of terminal cancer. On a lighter side, I love crafting of all kinds, especially quilting and fabric projects. I enjoy yard work and redecorating our home. I guess I’m just a very happy homemaker. 2. Tell us about your husband's eye condition and your understanding of how it has affected his vision. Dan has central serous retinopathy and macular degeneration. Both result in an eventual loss of central vision. Lighting makes a big difference in how well he can see. A sunny day, a gray day, rain, snow, dusk, night, inside lighting all affect how well he can see. His “blind” areas are not black spots, but gray smudges of “fog” which react differently to each lighting condition. When both eyes are working together it can cause him to see double or distortion. He has also lost the ability to see in color in his left eye which is another strange effect. It’s not just a simple “see or don’t see”. Every situation is different. 3. When did you first find out about your husband's diagnosis and what was your reaction to it? It was 1994. Dan was 49 and I was 48. On the day of diagnosis I felt sadness for Dan, fear for our future, anger at the doctor for his attitude, worried about where I was going to get the strength to get through this because my rock and safe place was always Dan, and I couldn’t turn to him to comfort me. We left the office and my mind was swimming. “What can I do for him? How can I help him? How can I provide for our family? He has always taken care of me and the kids. Who do I turn to? Now what?" 4. How have you adjusted and adapted as Dan's vision loss has progressed? Fortunately, it’s been a very slow progression. He has lost total central vision in one eye, but the other is still functional. I’d say that I didn’t adjust, but that we adjusted, and are still adjusting, together. In the beginning I’d try to follow his lead. He’s not one to ask for help or admit a need. Too often I would ask how his eyes are. He didn’t like that, so I quit asking and observed more. I try to accommodate him by not moving the furniture. I love to move furniture. Small sacrifice. I love to rearrange everything in the kitchen cabinets. I keep that to a minimum and anything he uses stays where it is. I do all of the driving. It sometimes requires me to return home from an errand to pick him up to go somewhere, but big deal. Any adjustment I make is nothing compared to the adjustments he makes every waking minute. Together, we take each day as it comes: laugh, cry, work it out together, find the good in it, and go on. 5. 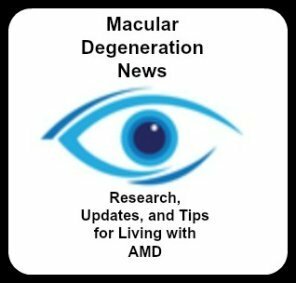 What do you find most difficult as a caregiver to someone with macular degeneration? In my case, it’s being overly helpful. Like our kids would say, “a helicopter mom. 6. What tips do you have to share with others who are in the same or similar situation? As in any relationship, communication is key. You need to come to an understanding of what the person with macular degeneration needs and what the caregiver needs. You need to be able to talk about it openly and laugh or cry when you need to. It helps. As a caregiver, don’t feel guilty about feeling good, or happy. Don’t feel guilty about commenting about your own aches and pains. They are still important. Try not to feel as if no one cares about you, when all they ever ask is how your loved one is. In a way that’s asking about you. If things are going well, then they know you are well too. Don’t be afraid to comment on a visual experience. Remember it’s only their eyes that have a problem. It’s not their ears, their body, or their mind. They are still the same intelligent, loving person you have always known. They might be having a bad day, it’s OK. You are allowed that bad day too, it’s OK.
7. How do you and Dan come to terms with finding a balance between fostering independence and performing tasks for him? I have learned to let him do the tasks he’s always done. I don’t do it for him until asked. Unless, of course, he’s gone beyond stubborn pride and it’s turning into something dangerous or destructive. It’s kind of like teaching a child in reverse. A child works at a task until they get it. A person with vision loss works at it until they realize they need to find another way. Then they work until they get it. 8. What forms of support from family members, Dan or friends have been helpful to you? Their love. Just being there whenever I need them. I know I can turn to all of them for moral, emotional, physical, and in one case, even financial help. I am very lucky. Dan has shown me how to take what could have been the worst event in the world and turn it into an unexpected positive new life. One we never dreamed of. The opportunity to help others world-wide with MD, making new friends, and experiences unimagined are truly blessings. Dan has put together a booklet titled Caring for the Visually Impaired. It's available for free on the MD Support website, and it's very helpful for understanding how to be caregiver. Thank you for this chance to offer some insight for others who are in my situation.